Leave the bustle of the city far behind and venture deep into pristine sandy desert. On this thrill-seeking safari tour, you’ll have your pick of adventures. Enjoy a high-speed chase across sky-high dunes in a sturdy Land Cruiser, hop a camel for a wild ride, and go surfing down the sand. Tours include a tasty open-grilled dinner spread and a traditional entertainment show. Having waited for 1hr 30min in hotel reception we were eventually picked up at 4pm. The driver told us we had been forgotten to be picked up. The experience was extremely rushed and only had 10mins on the dunes. The food was very disappointing which meant we lost a valuable day of our holiday. Where to start? Initially driver did not know where we were despite me emailing company well in advance. The journey took 2.5 hours to get there and 2 delightful! girls were told they'd be picked up at 3 but were collected at 3.50. No chat or info on way down, were transferred across to a 4x4 but not told where we were, name of desert etc. Actual dune bashing was a TOTAL blast, real unmissable fun as was photo op, a tad brief tho. However, once we got there, we were let off.....and that was it! ??? Driver returned to briefly tell us about an 8 pm pickup but we were left to own devices with no schedule for anything. Only reason we knew anything was because one of our party had done the tour 2 years before. For example, we had allocated seats - no one told this at all! Looking at the Tour Details, there was NO sandboarding...which I really wanted to do. The guy with the falcon wanted to charge so I left that, and we were accosted by a humourless man who stuck head wear on us and charged us 20 dirhams each. A schedule would really have helped a LOT. The food was very good as were the shows, especially the fireshow. Enjoyed the very brief camel ride also but not the relentless attempts to get more out of us. One REAL gripe was how the entire night was shamelessly biased to the Chinese tourists with long announcements in Chinese and even Chinese movie music being played! Ridiculous and really took away from the experience. maybe have Chinese only trips...I went for an Arab experience. Trip back was better and the driver was attentive but we all noted how a lot of drivers just threw discarded bottles etc. into the desert...a very sad sight to see indeed. Overall we DID enjoy it but several improvements need to be made...not massive either. But am still narked over the lack of sandboarding and being asked to pay for things ostensibly included in the cost. We had wonderful time at desert safari. 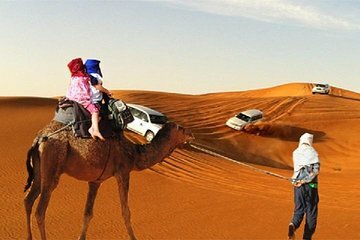 It started with 4 wheel jeep rude through sand dunes and ended at desert compound where we were offered camel ride, buffet dinner, belly dance and fire show. We visited Dubai in February and weather was very mild.